The work of a chef is extremely challenging. Numb heels, backache, cuts and burns are inherent, nothing to complain about. But the chef who wants to make it big today needs to not only master his kitchen but also become a farmer, a forager, a chemist, a fisherman, a researcher, a lean-mean-holistic-gastronomic-machine. It’s August in Finland. Nature is showcasing its abundance, and the head chef Sasu Laukkonen and his team at restaurant Chef & Sommelier in Helsinki are enjoying it to the fullest. Since 1st August I’ve had the privilege of being a part of the team as an apprentice. Yes, I have left steaming hot Italy, for the time being, in the need for fresh air, but also to put theory into practice. As we speak, I’ve been sweating and learning in the 9m² kitchen at Chef & Sommelier, alongside head chef Sasu for the past three weeks. Working sixteen-hour days, five days a week might scare most people off, but for me,even though it took some time to adjust, it has been a deliciously mind-blowing experience and I still have six weeks to go.. Chef & Sommelier is much more than just a restaurant. Aside from it receiving the title “Restaurant of the Year” bestowed by the Finnish Gastronomes’ Association, I consider it a showroom of deliciousness, as the restaurant truly is a factory of new, exciting flavours with its ways of using Nature’s fruits. Sasu himself is the pioneer determining the restaurant’s firm philosophy. He belongs to a new generation of vibrant chefs who step out of their comfort zone, leaving pots, pan and knives aside in search for new edible delights to serve to the loyal customers. Many of those customers specifically travel from places as far away as Australia, Korea and Japan, to savour his creations. Believe me, he makes it worthwhile. Together with his farmer Janne Länsipuro (yes, he has his own farmer), Sasu and his team select their vegetables and greens from the very seeds. But it doesn’t just end there. A rigorous watering, farming and harvesting scheme has been put in place. Everyone takes part – naturally. This is about as intimate as one can get with the raw materials if you ask me. When the final products start pouring into the restaurant, Sasu is like a proud father looking at his children. He smells, he tastes, he observes and then, he starts to cook. Magic happens.. Watching him work is truly an inspiration. Since Sasu and his team have a firm rule on keeping food waste to a minimum, almost nothing is discarded. And why would you throw away carrot or beetroot stems anyway? Have you ever tasted one or the other? They’re delicious, just for the record. But it goes beyond food waste. Since we just happen to find ourselves in the less sunny and warm side of the hemisphere, we simply don’t have access to certain raw materials that are taken for granted let’s say in Italy for example. It’s a fact and it doesn’t help whining about it. At Chef & Sommelier we just wine, we never whine. Sure it’s a bummer not to have lemons, artichokes, capers and coconuts growing in the backyard; it would be nice. But what if I told you that there’s a Nordic version of each of these yummy treats? Read and marvel. This is how it happened. 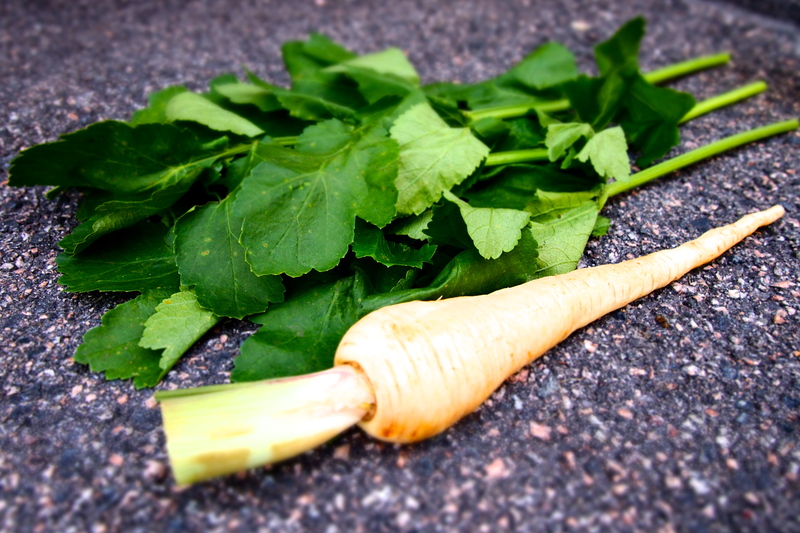 If most people would have a fridge full of parsnip leaves (if they had kept the leaves to begin with) they would probably blissfully ignore them and end up throwing them away when they’re rotten. Not Sasu. When he knew his precious parsnip leaves would only have a few more days left, something had to be done, quickly. Sauté and fry them? Been there done that. He needed something new. Ice cream? No kidding. He made the base using milk, cream, raw cane sugar and gluten free flour. Once done, he added a big bunch of parsnip leaves into the mix and switched on the blender. Vivid green and velvety. Just before pouring it into the ice cream machine he added a touch of caramelized butter to enhance the flavour – the secret ingredient? As the ice cream started taking shape and texture, a familiar smell filled the tiny kitchen. Could it be? Yes indeed. It was coconut. To check his judgement he had all of us taste it. It was coconut, no doubt about it. For the cherry on top, he grated some dehydrated parsnip from the late harvest last season. The result: a masterpiece that he baptised the “Nordic Coconut”. The Nordic coconut is just one of Sasu and his team’s great discoveries. Sunflowers picked when still about to bloom, preserved in oil before pan frying in butter, taste like artichokes; tagetes flowers that grow perfectly well here in the north have a citrusy flavour that easily replace the acidity of lemons; pickled dandelion buds are a perfect Nordic substitute for capers,and the list goes on. When curiosity meets talent and guts, anything is possible. Well, almost anything. “There’s no other way, it’s essential and natural. That’s what he says, and I couldn’t agree more.